If your child has been diagnosed with ADD/ADHD, and you cannot stand the thought of drugging your child, you should know that natural remedies do work. This information is suppressed from the public, as it means less money for drug companies. Chamomile and Lavender have powerfully calming effects. Read our article ‘Blending Essential Oils Safely’, to find out how to mix your own home remedy. Once you have blended your Essential Oils into your Body Butter or Carrier Oil, apply half a teaspoon to the abdomen, and half a teaspoon to the back. Massage your homemade Aromatherapy Butter or Oil, in gentle and slow movements, a few minutes, on each side of your child’s body. Do this every night, when your child is ready for bed. If you prefer, use our ready-made Lavender Body Butter, or our ready-made Chamomile Body Butter. Eat a diet high in protein – especially eat fish which is high in omega 3: for example, wild salmon, tuna, mackerel, sardines. Note: Eating red meat can make certain children hyperactive, due to the adrenalin in meat. Avoid refined carbohydrates – for example, cookies, pancakes, waffles, biscuits, cakes, white bread, brown bread, bagels, white rice, pizzas, refined flour pasta. Eat a diet high in complex carbohydrates – for example, legumes, whole grains, nuts, seeds, sprouts, fruits, vegetables, wholegrain pasta, wholegrain breads. Avoid sugar, artificial sweeteners, honey, high fructose corn syrup, corn sugar, corn syrup – for example, candy, cookies, chocolates, ice-cream, soda, or any other foods containing these. Read labels, and avoid foods containing – tartrazine/ red dye No. 5 / monosodium glutamate / TBHQ. All these food additives have been proven to cause ADHD, in hundreds of scientific studies. Coffee – children can become hyperactive, from drinking coffee, so avoid this beverage completely. Omega 3 with the ratio 7:1 EPA to DHA, meaning, 70% EPA. B complex calms the nervous system. Zinc 5 to 10 mg per day– makes melatonin, which creates deep, calm sleep. Magnesium Glycinate 100 to 200 mg per day – relaxes the muscles. If the diet is poor, or your child does not eat much, give them a full Multi-vitamin/mineral supplement. Many cheap Multivitamin supplements do not contain adequate dosages to make a difference. I recommend Solgar Earth Source Multi-Nutrient Dietary Supplement. There are excellent Homeopathic Formulas for ADHD, which can be bought online, should you not be able to afford a visit to a Homeopath. An allergy to gluten in wheat products, or an allergy to dairy products, can have a devastating effect on a little body. Try eliminating one suspected food at a time. No dairy for a week – note any improvement. Then no wheat for a week, and so on. A friend of mine took her seven year old son to a Chiropractor, for general health improvement. He adjusted the child’s neck and spine. He had experienced the pressure in his head for so long, that he thought it was ‘normal’ to have pressure in your head, until it was gone. It is these kinds of unrealized body burdens, that may be affecting your child’s behaviour. Wouldn’t you act a bit crazy, if you had a permanent headache? Many Chiropractors also offer anti-candida and anti-parasite supplements. Having either of these conditions, can make a child appear to have ADHD. Read our article The Candida Diet, to find out if you may be able to reverse your child’s apparent ADHD, simply. 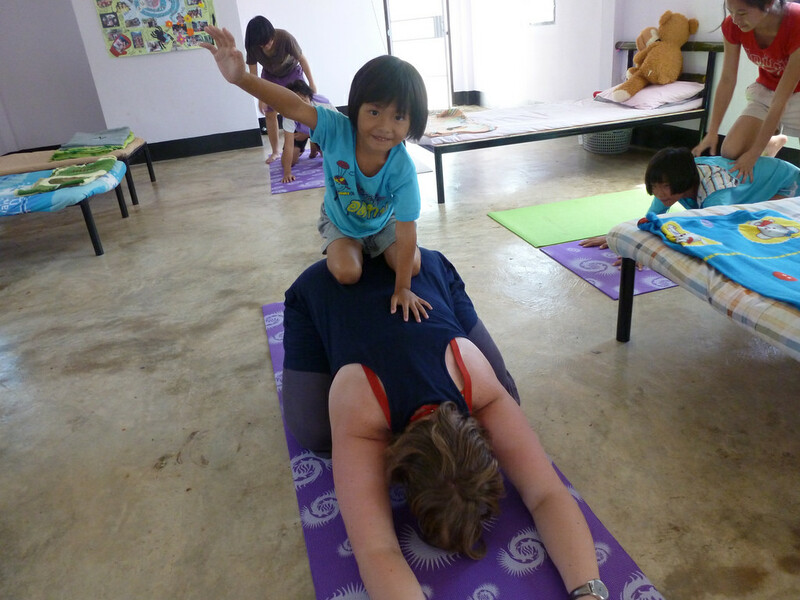 The best way to re-teach your child to calm down, and to focus, is through Yoga classes for children, at least once a week. Try to encourage your child to practice their yoga for at least ten minutes a day, so that their nervous system has a chance to become re-programmed towards calmness.